Lenovo's Moto Z line, which launched last year, to this day remains pretty much the only success story of the push for a modular smartphone, even if it does so by a little stretch of the definition of the term. But this was last year, which means it's about time we got to see the latest new additions to the line, namely the the Moto Z2 and Z2 Force. ...Well, not exactly. From what we've gathered so far, it seems this year Moto has decided to forego the release of an ultra thin Moto Z2 model entirely, instead sticking to the beefier Z2 Force only (as well as the already released Z2 Play mid-ranger). There's a lot of evidence to support this theory: that leaked timeline from a few months back which showed no Z2, the complete lack of any pictures and/or renders of a thin Z2 model, as well as us only seeing leaked specs of a single high-end Z2 model. 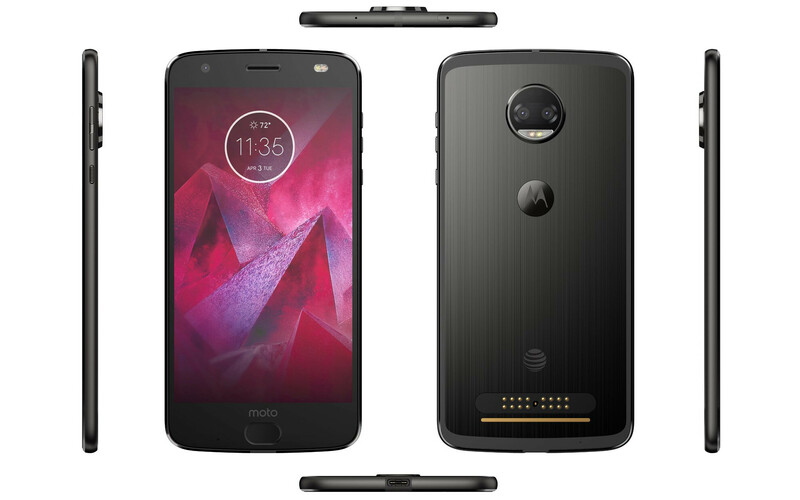 What you're seeing above is an alleged official render for the AT&T variant of the Moto Z2 Force, courtesy of Evan Blass. The differences between it and last year's Z Force are relatively small: on the front, the fingerprint sensor is now pill-shaped instead of square, and the front-facing flash is now elongated (as it's now a dual-LED flash). On the back, the large, circular camera hump now looks to be better utilized, thanks to the inclusion of a dual camera module. We can also see a couple of other details: the buttons on the right side have been slightly reconfigured, while the metal body of its predecessor, as well as the regrettable lack of a headphone jack, have been transferred over. We have two separate sets of real-life pictures of the device as well, though one is a little bit on the blurry side, while the other shows the phone tucked inside a light blue protective case. We've finally gotten a proper leak of the Z2 Force's specs, and they fall pretty much in line with previous but unconfirmed benchmarks we've seen previously. And just as expected, things are pretty powerful on the inside: a Snapdragon 835 chipset, 4 or 6 gigs of RAM, and either 64 or 128 GB of storage. That discrepancy in terms of specs is due to regional differences: the U.S. gets the worst combo of them all, with 4 GB of RAM and 64 GB of storage; the rest of the world gets a 6 GB RAM version instead; and lastly, China gets 128 GB of storage to top it all off. However, it's worth noting that all versions of the phone will have an SD card slot. The device also sports what appears to be pretty much the same display as its predecessor: a 5.5-inch panel with a 1440 x 2560 resolution. And as per the leaked Moto devices timeline we've seen before, that display will once again be of the so-called ShatterShield variety, meaning it can withstand a much rougher handling. Last year's Z Force out-specced its sibling, the Moto Z, in a couple more areas than just the display, though. Its other defining feature was the bigger, 3,500 mAh battery. And seeing as the Z2 Force carries the same brand name, as well as the relatively large thickness of the Z Force, we expect to be seeing a beefier battery make an appearance this year, too. Edit: never mind this — it appears the Z2 Force will actually do away with its predecessor's big battery in favor of reduced thickness: the latest leaks claim it will come equipped with just a 2730mAh battery. The phone is said to have no IP rating, but will come coated in a "water-repellent nano-coating,"
As per the same benchmarks above, we also know the Z2 Force will feature a 12 MP camera module on its back, which will be of the dual camera variety this time. We don't officially know what configuration the phone will be equipped with, but the two lenses appear to be the same in the real-life photos above, which leads us to believe it'll be a color-monochrome camera combo. Also, at least one of the renders shows the camera will retain the laser autofocus of its predecessor. Meanwhile, the front camera was shown to be a 5 MP shooter, which will once again come with a front-facing flash, this time upgraded to dual-LED. What's interesting is that the Z Force's beefier, 21 MP shooter has been seemingly downgraded this year. This, curiously enough, falls in line with a rumor from all the way back in July of last year (! ), which claimed Moto will be cutting down the megapixels in favor of bigger sensors. 2017 #motoz #motox #Lenovo enhanced low light images LOWER MP Bigger μm Quality Lenses Laser AF OIS ;) FIX this!Sorry for being TOO AHEAD ! But the defining characteristic of the Z line as a whole is the compatibility with Moto mods, the exchangeable covers which give existing devices new functionality, such as the ability to project the screen to a wall, play loud, stereo music, or simply get more battery life. Existing mods will no doubt be compatible with the Z2 Force, but we also expect to be seeing a slew of new ones released shortly. These include a top-mounted 360-degree camera, a Hi-Fi studio microphone, a DirecTV tuner, and more. In fact, Moto has previously promised to release 12 new mods this year, so we can expect to see several of the above (which are still technically just concepts, not final products) make an appearance at the device's launch event. Lenovo itself has accidentally leaked the device recently on its Chinese website. 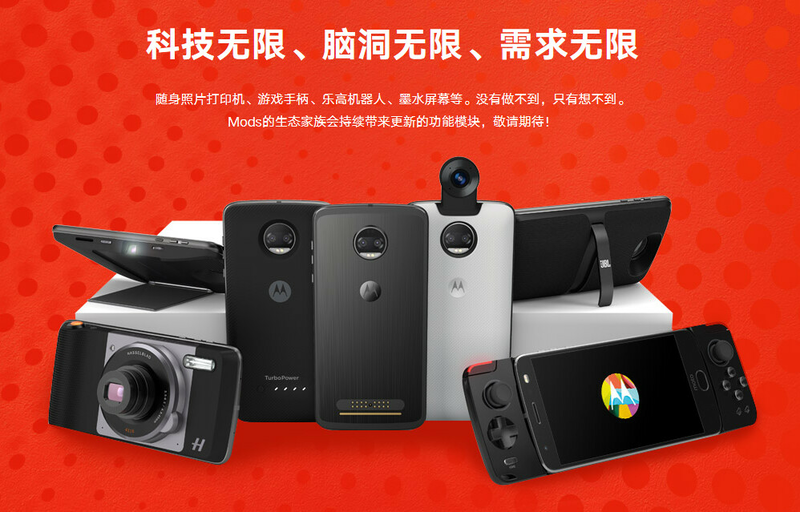 The screenshot above is from its Moto mods info page, and shows the device equipped with several mods, though the only new one appears to be the 360 degree camera one. Thus, it's fairly possible Moto is only planning to release it instead of the whole leaked concept roster, which we'll admit is a tad disappointing. We expected the device to come out late last month, due to a curious official event poster from Moto featuring the device, but this turned out to be a false alarm. However, we have now received the real thing: an invitation to a Moto product unveiling which will be held on July 25 in New York. But besides the Z1 Force, we wouldn't be surprised if Moto finally showed off a couple of its other unannounced devices, including the Moto X4 ant the G5S/G5S Plus duo. So mark your calendars! We also know that this time around the phone will be offered by all four major U.S. carrier. This is a major shift compared to last year's Z Force, which was available on Verizon only, and it also means we won't be seeing a return of the Droid branding. Lastly, its price (in India, at least) has allegedly been leaked already, too: Rs 38,999, or about $600. This puts it at a pretty competitive price range, just a bit higher than the OnePlus 5, which retails at $540 for the beefier Midnight Black edition. Still, U.S. prices tend to be lower than the rest of the world's, so there's a fair chance the Moto Z2 Force will be available for less stateside.